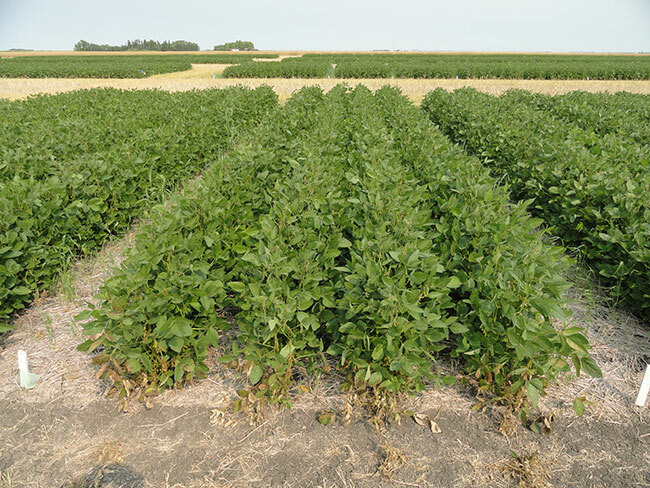 “Our growing conditions in southern Saskatchewan are different than the traditional soybean growing areas, and even different from some of the soybean areas in Manitoba. We wanted to see if the seeding recommendations in Manitoba would work here,” Holzapfel says. Holzapfel looked at seeding date, seeding rate and seeding depth at Indian Head and Swift Current. Row spacing research was conducted only at Indian Head because the specialized seeding drill needed to vary row spacing was only available at Indian Head. The research was conducted from 2014 through 2017. During these four years, a wide range of growing conditions was encountered from very dry conditions at Swift Current in 2017 to wet conditions at Indian Head in 2014 and Swift Current in 2016. Plot seeders used side-band openers. Generally, the recommended time to seed soybeans is when the soil warms up to 10 C – usually mid-to-late May. To test this recommendation, Holzapfel evaluated three seeding dates targeted at early May, mid-May and late May-early June. He says that the research results support that recommendation. Seeding during the first two timings produced the highest yields, while delaying seeding into late May-early June resulted in yield loss approximately one-half of the time. At Indian Head, soybean yields were the highest with the first two seeding dates. At Swift Current, yields were highest with the mid-May seeding dates, followed by the early seeding date and the late seeding date. Holzapfel says that with 14 to 20 per cent lower yields on average, late seeded soybeans tended to suffer from a shorter vegetative growth period and, in some cases, premature termination by fall frost. Soybean seeding depth is generally recommended at a depth of less than one inch deep. In Holzapfel’s research, two seeding depths were tested. Shallow seeding was targeted at around three-quarters of an inch and deeper seeding at around 1.5 inches depth. Differences in emergence were found at three of eight sites; two were better with shallow seeding and one better with deeper seeding (under very dry conditions). Plant densities were five per cent lower with deeper seeding. Pod clearance was slightly reduced with deeper seeding 25 per cent of the time. Maturity favoured shallow seeding, but by only 0.3 days. IHARF’s plot seeder has adjustable row spacing. Seeding rate recommendations for solid seeded soybeans in Western Canada range from 200,000 to 250,000 seeds per acre (49 to 55 seeds per square metre) targeting a minimum stand establishment of 25 plants per square metre. Holzapfel evaluated seven seeding rates from 60,000 to 350,000 seeds per acre (15, 30, 40, 50, 60, 70, and 85 seeds per square metre). Holzapfel says that averaged across all sites, yields were maximized at 70 seeds per square metre, but in years where growing conditions were better yields tended to level off at slightly lower rates of 50 to 60 seeds per square metre. He says the yield benefits observed with higher seeding rates were at least partly due to increased pod clearance and larger seeds in addition to the higher plant densities. Previous research in other areas indicates that narrower row spacing produce similar yield as soybeans grown on wide row-crop spacings. 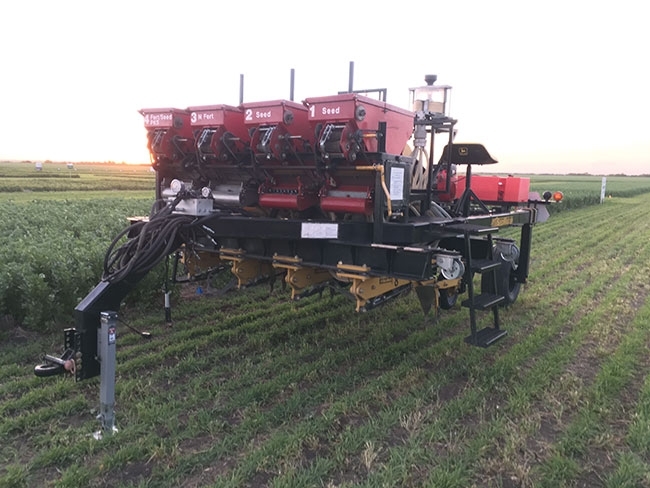 Holzapfel looked at 10-, 12-, 14-, 16- and 24-inch row spacings at Indian Head over the four years in combination with the seven seeding rates. Yield response to row spacing varied widely, depending on the growing conditions at each site. Averaged across all four years, yield increased linearly with row spacing from 25 bushels per acre (bu/ac) (1688 kilograms per hectare or kg/ha) at 10-inch spacing to 27 bu/ac (1812 kg/ha) at 24-inch spacing, a seven per cent advantage. However, this was mostly due to increased yield at wider row spacing under very low yielding, stressful conditions in 2014 and 2017. Conversely, in the highest yielding year in 2015, yields were significantly higher at 10- or 12-inch spacing than at 14- or 24-inch row spacing. Holzapfel says that most research suggests no effect or a slight yield advantage to narrower row spacing, and his study seems to support those findings. The advantage to using planters on wider row spacing comes from lower seed mortality and the ability to reduce seeding rates and seed costs. Putting all the trials together, under conditions encountered in southern Saskatchewan, the home-grown recommendations would be to seed in mid-May when temperatures reach 10 C, seed shallow at less than one-inch deep (except under very dry seedbed conditions), seed at 200,000 to 250,000 seeds per acre (49 to 55 seeds per square metre) targeting a minimum stand establishment of 25 plants per square metre. Soybeans are also well adapted to seeding with air drills on narrower row spacing.